This morning, many IP professionals attended the Diversity in IP breakfast in London, which was organised by AIPLA, CITMA, CIPA and FICPI-UK. At the event, there was much talk about the reasons why IP organisations should think seriously about diversity and inclusion – staff happiness, employee retention, job satisfaction, client wins and client retention were just of the motives mentioned by the speakers. (See our Twitter feed for more of the points made during the event).Once you are convinced that equality, diversity and inclusion are important, you may wonder what you and your firm needs to do next. Today’s blog article has kindly been provided by Victoria Barker, Associate at Kilburn & Strode LLP, and is about her and her firm’s efforts to improve diversity, and in particular, gender equality, in the workplace. Kilburn & Strode are one of our Charter signatories. Victoria writes: The 2013 book by Sheryl Sandberg, Lean In, has undoubtedly been controversial. In the book Sheryl explores factors that may hold some women back in the workplace, mostly by looking at her own experiences. For example, she mentions creating special parking spaces for pregnant women near the front door to her employer’s building when she was faced with a long walk across the car park during her own pregnancy. The book aims to inspire women to take a more active role in developing their career, and encourages men to provide support for women so they can do this. Not all of Sheryl’s comments have been well received, with some critics calling the book little more than a manifesto for privileged white women. Nevertheless, by starting a conversation on gender issues in the workplace, the book has led to the formation of more than 32,000 “Lean In Circles” in 151 countries worldwide. “Lean In Circles” are groups of like-minded people of both sexes coming together to discuss issues that affect (primarily) women in the workplace. Circles can be big or small, open to new members or closed, physical groups or online-only – whatever suits the members best. Some of the Circles are affiliated with an employer, others with a geographical location, and still others with a specific career path or job title. 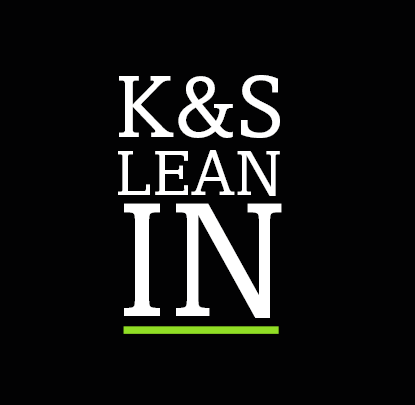 In April, Kilburn & Strode joined the Lean In community and held our first Circle meeting. Our first meeting was a general introduction to the book and the idea of Lean In Circles, and we did a few short activities aimed at finding out what topics were most relevant to our group. Unsurprisingly confidence, or more accurately a lack thereof, was a common theme. Our second session will therefore focus on communicating with confidence, and will be held in early July. Why we thought we needed a group strikes to the heart of why groups like IP Inclusive exist at all. Until there is true equality there will be a need for groups, big and small, that look at how this can be achieved. Of course, achieving gender equality is not just a women’s issue, and we were pleased to see a number of men attending our first meeting. When looking into setting up the Circle, I was struck by the statistic that, at the current rate of progress, it will take nearly 200 years for gender equality to be achieved. It is said that a snail will be able to traverse the length of The Great Wall of China in about the same time. A snail’s pace of progress just isn’t good enough, and we can’t hope to pick up the pace of change by doing nothing. As one of the founders of the K&S Lean In Circle, I have been asked many times what my goal for the Circle is. The Circle won’t be for everyone, and I doubt that we can make huge, wide sweeping changes for every woman in our workplace. Indeed, many of the broader changes required for gender equality have already been made, and I think this lulls many people into believing that we, as a society, have achieved gender equality. Our aim with this group is therefore really to start a conversation on barriers to women succeeding in the workplace and to keep gender equality issues in people’s minds. We do, of course, hope that our Circle will inspire its members to make a positive change in their lives, whatever that might be. If you would like some advice on setting up your own Lean In Circle, please get in touch via the comments section below or via e-mail.Thank you Victoria for setting up the Lean In Circle, and sharing your experience with the IP community. We hope others will be inspired to do something similar in their own organisations.​If you would like to write a blog article for IP Inclusive, on anything diversity related, please email Emily Teesdale of Abel & Imray. Guest bloggers are always very welcome!